As weather starts to warm, the snow is turning to rain, and that means you can’t slack off when it comes to auto cleans for your car. Clean Getaway car wash in Kalamazoo has the best products and state-of-the-art technology at all our locations to make sure that your car gets the wash that it needs every time you drive through. As rains continue to come down and create an environment prone to dirtying vehicles, trust in Clean Getaway to keep yours spotless. One of the most important times to wash your car can be after rainfall. Although rain may wash dirt and salt away, it can bring with it its own set of problems for your vehicle. When rain falls from above, it can collect pollutants and contaminants from the air. 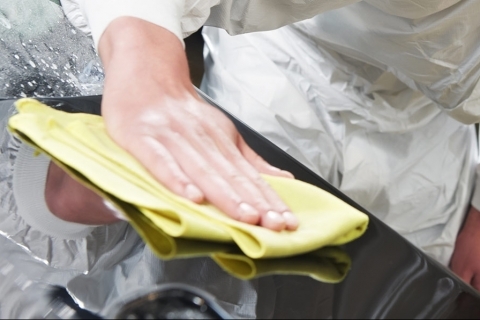 Although not quite potent acid rain, these contaminants can still leave water spots on your car that can etch away at paint and potentially cause defects. It may take some time for these effects to occur, but you can wipe away any doubt with a quality auto clean at Clean Getaway car wash in Kalamazoo. Although rain can wash away some of the salt left over from winter roads, you don’t want to assume it will get rid of it all. By coming to Clean Getaway car wash, you can ensure all traces of salt are gone from your vehicle, while also providing lasting protection with a wash and wax. The soft water used by Clean Getaway won’t linger like rain water, and reverse osmosis guarantees no water spots remain after your wash.
Clean Getaway has the products and technology that can keep your car clean time after time. No matter what type of vehicle you own, you can get it washed with us today!